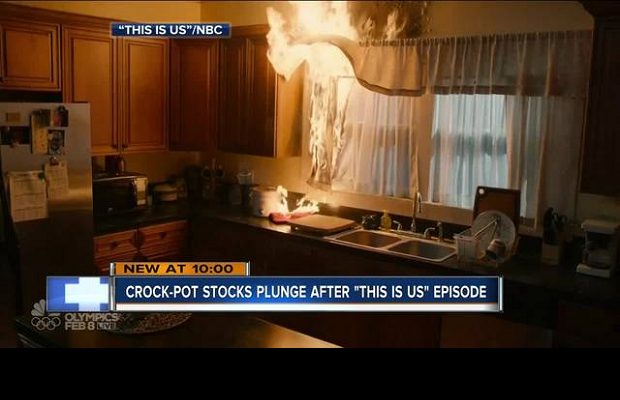 Crock-Pot found itself at the centre of a social media maelstrom when “This is Us” revealed that the cause of the house fire that killed Jack Pearson was a faulty slow cooker. 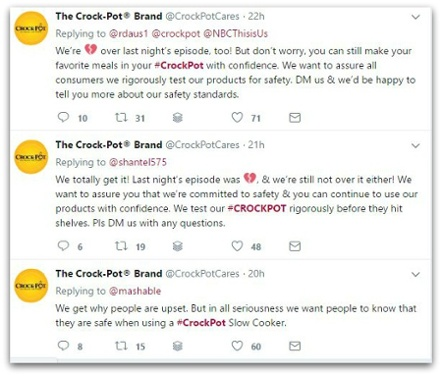 After the episode aired last month (Jan 23rd) , the stock price of the Crock Pot brand plummeted, causing a PR nightmare. Crock-Pot soon came out with a statement calling the scenario ‘nearly impossible’ and insists that a similar situation has never occurred. He starts off in a sombre tone, about how the country is divided, before openign a Crock-Pot full of chili and serving himself a bowl, making it clear that he was talking about forgiving the Crock-Pot. The screen then flashes the Crock-Pot logo, and the hashtag #CrockPotIsInnocent appeared on the screen. On Feb. 3, after the “This Is Us” ad supporting the slow cooker was released, digital content engagement around Crock-Pot increased by 84%, according to data crunched by Amobee. Overall, since the slow-cooker episode of “This Is Us” first aired on Jan. 23, digital content engagement around Crock-Pot has increased by 154% as compared to the time period between Jan. 11 -22, 2018. Since then, 57% of all Crock-Pot digital content engagement has been This Is Us-related, with 29% of all Crock-Pot digital content engagement being Super Bowl-related. “The overwhelming positive sentiment around the #CrockPotIsInnocent hashtag reaffirms that not only are ‘This Is Us’ fans able to tell the difference between a fictional storyline and the reliability of the real product, but that they have a sense of humor around their favorite show as well,” said Jonathan Cohen, principal brand analyst at Amobee.